Experts across academia, civil-society organizations, the private sector including formal and informal collectors, dismantlers and recyclers as well as producers, as well as urban authorities (municipalities) have contributed to the outcomes of the workshops as well as the final deliverables. After 4 years of supporting sustainable reuse and recycling of e-waste initiatives in sub-Saharan Africa, and through its activities of operationalizing the UN Step model of “Best-of-2-Worlds”, WorldLoop has become proficient in supporting the efforts to bring circular economic solutions to Africa and this expertise was leveraged for EWIT’s Expert Modelling Workshop – Closing the Loop. 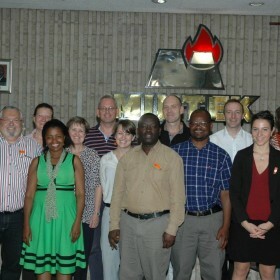 The Closing the Loop workshop took place in December 2015, at Mintek in Johannesburg, South Africa. 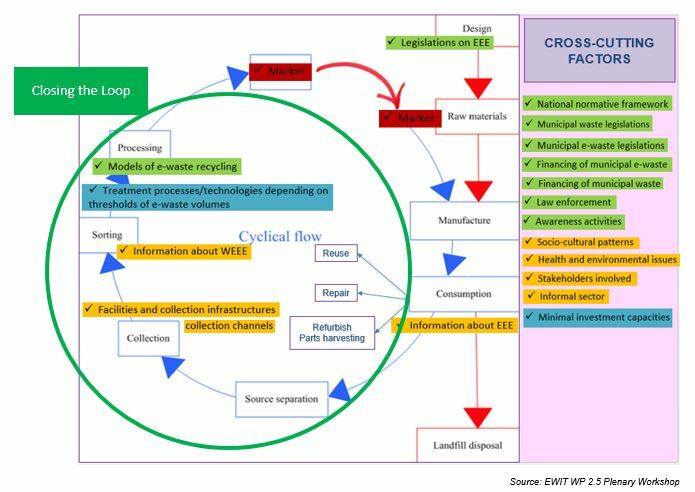 As the scope of the EWIT project is limited to e-waste management implementation, the focus of this workshop was on implementable improvements for the e-waste value chain within each municipality although consideration was also given to additional principles of responsible importation, product life/eco-design and upcycling. As a result of this two-day workshop, WorldLoop drafted the Closed-Loop Operating Guidelines, providing specific recommendations per municipality to develop an e-waste management system inclusive of circular economic principles as well as common challenges and solutions to improve the e-waste value chain starting with collection, continuing with good reuse, parts harvesting and eventually resource extraction and how to connect, according to a “circular economy” –symbiotic vision, to selected end user industries that will benefit for the availability of secondary raw materials. An emphasis was placed on solutions within the local economies. Only considered in the case of Johannesburg Municipality due to technology available in Johannesburg and current discussions at policy level to improve recovery rare-earth elements.